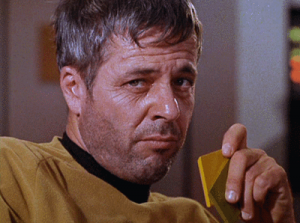 I was very sad to hear about the passing of actor William Windom. This episode consistently makes top ten lists of Star Trek episodes and deservedly so. Windom plays Commodore Matt Decker, a captain who lost his starship to a giant planet-sucking “doomsday device” and is obsessed with obtaining revenge. In a crazed state, he pulls rank to take control of the U.S.S. Enterprise and puts the lives of its crew in great danger as he takes the ship in hot pursuit of the planet-killing machine. When I was in high school and had the chance to “teach” a Trek episode to a Grade 9 English class, I chose this episode. Windom gives a brilliant, if over-the-top performance, as Decker. His passion and enthusiasm and range of emotion in the episode make it work star to finish. It’s one of my favourite episodes and I look forward to watching it again to pay tribute to this fine actor.